Designed to provide a perfect balance between portability and comfort these are some of the lightest down sleeping bags in the world. Taking advantage of our high fill power (880+ Euro Standard) ethical down means we need a lower quantity of down to make a comfortable lightweight sleeping bag for travel and sport applications. Less down means less weight to carry and the high lofting ability of our superior ethical down means they pack down incredibly small. 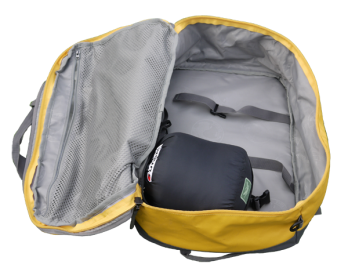 When we started to conceive our Supalite range of sleeping bags we had the idea of creating a small, very lightweight sleeping bag that could easily be carried in aircraft ‘carry on’ bags. We wanted them to fit into our idea of carefree travel so you could be off the plane as soon as it lands and through customs and exploring within 30 minutes of landing. It is this that is possible with the Traveller model! Another enjoyable benefit of a lightweight sleeping bag is when lightweight backpacking. You can take the lightest of equipment into the mountains and really travel light. You can enjoy being at one with nature and travelling unencumbered is entirely fitting to enhance your enjoyment of the great outdoors. Your lightweight Levo sleeping bag really can help you achieve this. Completing the range is the ultralight Minimis sleeping bag which at c.420 grams is ideal for mountain marathons and similar endurance events set in warmer climates, where as a competitor you must carry a sleeping bag. Rather than make the bag the smallest possible we have more generous dimensions so you can enjoy a good nights sleep and recharge your body so you can power along the next leg of your journey. After all, a comfortable restful night can of the greater benefit of recharging you than carrying a sleeping bag that is only a few grams lighter! Our outer fabric and linings are also weight saving, typically 37 grams/sq. metre of material, yet robust enough to withstand the rigour of travel and the outdoors. Our lining fabric is “Toray See it Safe” fabric. Incorporating silver thread we chose it for its anti-odour and anti-microbial properties resulting in improved living conditions inside the sleeping bag. The See it Safe technical fabric is used in medical and hospital environments to resist the spread of superbugs like MRSA. It is especially useful when used for travelling over longer periods.